Free and open to the public June 4th and 5th daytime hours, the SF Design Week Hub with WestEdgeSF is command central for all things design. From exhibitions to panel discussions, the opening reception, and more, this is where you want to be to kick off a week celebrating design in the Bay Area. For an added bonus, if you register (no fee!) 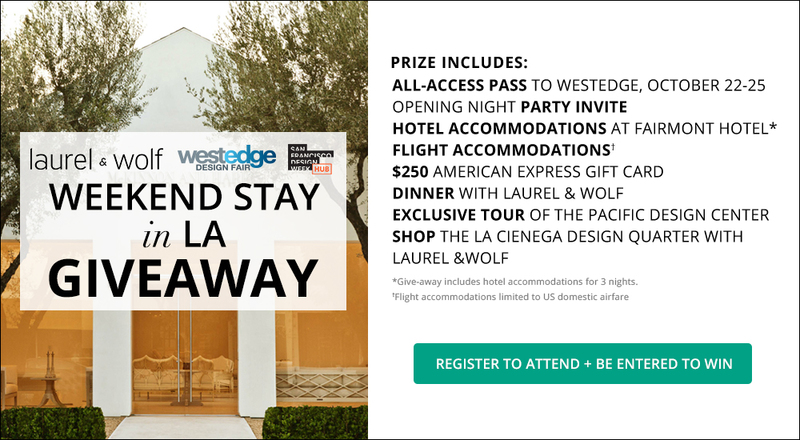 for SF Design Week Hub with WestEdgeSF Daytime Hours, you’ll receive a Where SF discount card to hundreds of San Francisco restaurants and attractions—plus you’ll be entered to win a “Weekend of Design” trip to LA from Laurel & Wolf. Register to attend and you’ll be entered to win!